The village of Great Oakley and the hamlet of Stones Green together with parts of the surrounding rural area of the Tendring District in North East ESSEX. This website is intended to support residents and potential visitors to the Parish with information and contacts. It is also used by the Parish Council to make available details of its activities together with information provided to us by Essex Police, Tendring District Council and other local sources. It is also intended to carry details and notice of local Community activities and initiatives together with locally organised events and achievements. The following extract is taken from a notice issued as a result of there being an inadequate number of candidates elected to the Great Oakley Parish Council following the recent nomination procedure forming part of the preparations for the May 2nd District and Parish Councils election. A further election process is now required. 1. Nomination papers may be obtained from the Clerk to the Parish Council by arrangement with them or the offices of the Returning Officer at the Town Hall, Station Road, Clacton-on-Sea, Essex, CO15 1SE during office opening hours (8.45 a.m. to 5.15 p.m. Mondays to Thursdays and 8.45 a.m. to 4.45 p.m. on Fridays). 2. Completed nomination papers must be delivered by hand to the Returning Officer at the Town Hall, Station Road, Clacton-on-Sea, Essex, CO15 1SE during office opening hours (8.45 a.m. to 5.15 p.m. Mondays to Thursdays and 8.45 a.m. to 4.45 p.m. on Fridays), from the date of this notice but not later than 4.00 p.m. on Thursday 25 April 2019. The above is an extract from the document issued by the Returning Officer for Tendring District giving full proposed details for this new election which may be downloaded from this website by clicking here or copies may be requested from the Clerk to the Parish Council by arrangement with her. The OAKSTONES CLUB will hold their annual Spring Sale in Great Oakley Village Hall on Saturday 27th April 2019 from 10am to 12 noon - click here to download and read the details in their poster! 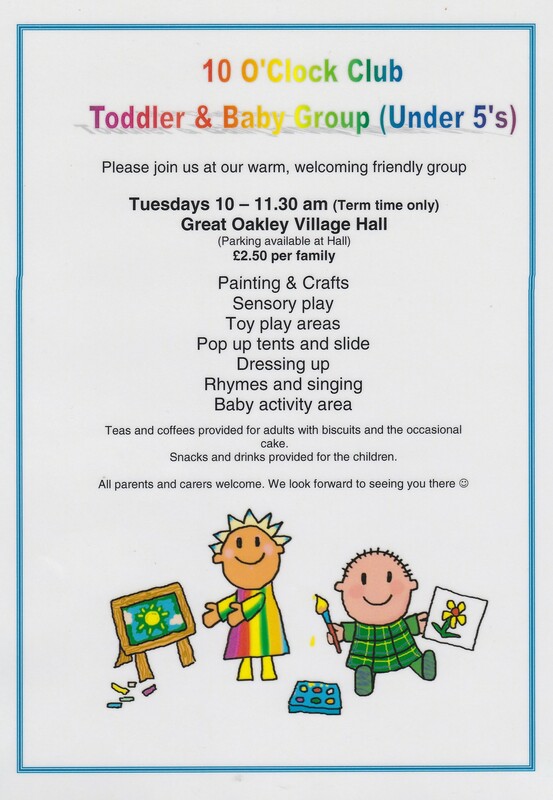 Tuesday mornings for "under 5's" the TODDLER AND BABY group meet in Great Oakley Village Hall from 10:00am to 11:30am for all manner of fun activities - £2.50 per family - many years experience - refreshments provided for children and adults - click here to download some more details and/or come to a session to see for yourself. Read a message from our Commissioner by clicking here. He speaks about increases in local visible policing, plans for the fire service and protection of children from abuse and recruitment into the world of drugs, sexual and physical abuse and crime, AND …..
Victims of Domestic Abuse - Help and support via a single phone call..
"COMPASS" is funded by Essex County Council and the Office of the Police, Fire and Crime Commissioner for Essex to support victims of domestic abuse across Southend, Essex and Thurrock. It will help women, men and young people aged over 16 to access specialist support including community-based services and specialist accommodation to help them recover and move on from domestic abuse. "COMPASS" is accessible 24hrs a day. Callers can speak with a trained member of staff by ringing 0330 333 7 444 . There will also be an online form for public and professionals to make a referral via the website. To read more, click here to see and download a copy of the message from the Police, Fire and Crime Commissioner. click here to read a message from Essex Police about their release of the film "Brecks Last Game" and advice on dealing with this issue and what to do if you spot anything which might arouse your suspicion. The hard-hitting film carries an important message – "Do you really know who your online friends are? "’ and is based on the real-life murder of 14 year-old Breck Bednar in Essex in 2014. Another photo gallery has been added to this website - photos of some of our fabulous flower arrangers - to see photos of them and some of their work click here to go to the relevant photo gallery! After "years" of being open every day, run entirely by volunteers, a call is now being made for some "new blood" to join the team of supporters - if you may be able to help, please call in at the pub and find out more. Click here to visit the website for OUR Maybush Inn. Welcome to the website of Great Oakley Parish Council serving the hamlet of Stones Green and the village of Great Oakley, near Harwich in N.E. Essex.